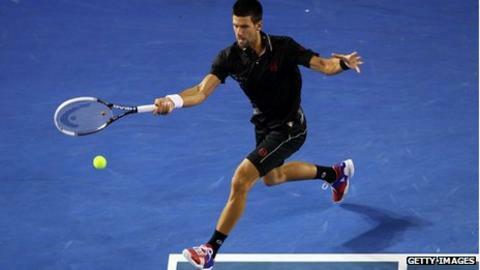 Novak Djokovic overcame a stubborn Lleyton Hewitt in four sets to reach the Australian Open quarter-finals. The reigning champion, 24, beat the 30-year-old Australian 6-1 6-3 4-6 6-3. Djokovic was cruising after winning the first two sets, but he then had to withstand a powerful Hewitt fightback, dropping his first set of the tournament before completing victory. The Serbian now faces Spaniard David Ferrer, the fifth seed, who beat Richard Gasquet in straight sets. Such was Djokovic's early dominance, Hewitt, now ranked 181 in the world, did not hold a service game until the fifth game of the second set. Reigning Wimbledon and US Open champion Djokovic, who is now unbeaten in 18 Grand Slam matches, made light work of the first set in Melbourne, racing into a 4-0 lead before a break which proved to be Hewitt's only game of the set. But the world number one paid tribute to Hewitt's fighting spirit, suggesting that the Australian's improvement swung the match in the third set. Djokovic had only lost 10 games on his way to the last 16 before giving up 13 against Hewitt. "I have to give credit to Lleyton, who never gives up," said Djokovic. "He's a great competitor. "He made me play an extra shot and I made a couple of unforced errors and he got back into the match. "For two sets and a 3-0 I was playing well and suddenly I stopped moving. He was making me earn my points and I wasn't able to and made a lot of unforced errors in the third set." Hewitt, who last reached the quarter-finals in 2005, produced a more even contest in the second set, breaking to make it 2-1, but could only hold serve twice more as Djokovic took a comfortable advantage. Djokovic raced into a 3-0 lead at the start of the third set, but Hewitt then won three straight games to maintain some pressure. The Aussie then broke again to lead 5-4 before taking his fourth set point to halve Djokovic's lead and land a major blow against the first seed. Djokovic withstood a break point to lead 2-1 in the fourth and finally picked up a break himself to move 4-2 ahead but, after Hewitt had held his serve, Djokovic completed a hard-fought victory. He now comes up against Ferrer, who lost to Djokovic in the quarter-finals in 2008, as he continues his quest for a third straight Grand Slam.